Many people that I have met on my path are convinced that they have no problem with empathy. They say that they can listen patiently and then show compassion and understanding by suggesting a solution, sharing their experience or giving a helping hand, so “no problem”. However, when I talk about empathy, I mean empathy in the understanding of Marshall B. Rosenberg. According to him, empathy means emptying (“purifying”) our mind and listening with our whole being. It is also “a respectful understanding of what others are experiencing”. Empathy arises when we manage to get rid of all preconceived ideas and judgments about the other person and when we listen carefully to feelings and needs and accompany the other person without judging, giving advices or comforting. If we truly want to hear another person, it is worth focusing all our attention on them, on what they say, what they feel and need at the moment. In such circumstances they will have a chance to fully express themselves and thanks to a deeper connection we will be able to really grasp what is going on and what is the most important. It will also help them to reconnect with themselves in a deeper way and eventually find the best strategies to fulfil their needs. Remember that empathic listening does not mean consent with the speaker, but it is an attempt to understand what he/she wants to express. Staying in the state of total attention and presence is not easy. Usually after a few minutes (in case of some people even after a few seconds) we want to share our experience, opinions or advice, we want to console or cheer up. In this way, we cut the connection, start bringing attention to ourselves and “kill” empathy, although our intention was to support the other person. “Killers” of empathy block honest contact, generate misunderstandings and conflicts, and may cause discouragement and anger in the person we listen to. Note that the result of most of these reactions is focusing attention on ourselves or other people instead of on the person we are listening to. However, usually when we use them we want to show our care and help the person in need, and it may happen that, in certain situations, they are accurate thing to do to create contact. They are just not an empathy. Do you know these “killers” from your own life? I want to underline once again that everything we do or say when we listen with empathy, we do or say for the benefit of the person we listen to. This way he/she can better understand himself/herself and realize what is really important to him/her. Remember, in this moment the light falls on that person, not on you. You are there to accompany, support and be kind of a mirror in which the speaking person can look at themselves. How can this be done in practice? Listening without saying anything is, in my opinion, a key element of listening with empathy to others. During my workshops I meet many beginners who find it very difficult. It seems unnatural to them (“We do not act like that on a daily basis!”), or even impossible – to withstand 5-10 minutes without talking, it’s quite an art :). After some time, however, it becomes a second nature and miracles begin to happen. The person we listen to enters areas which they would never have reached if we had interrupted them with our words. They touch on topics that are really important to them and they have time and space to look for what is crucial to them. Once we give enough time to say aloud what was the most alive in the other person, we can start guessing their feelings and needs. For example: “Are you sad, because you want respect?”, “Do you feel irritated and frustrated because autonomy is very important to you?”, “Are you excited because your need of creativity and joy is fulfilled?”. It is important to remember that the word “guessing” was not used accidentally. It emphasizes that when I’m guessing, it means that I only “suspect” what the other person may feel and need, and I check if it is true by giving that person space to reflect and respond. It has nothing to do with stating the facts, telling someone that I know for sure how they feel. On the contrary – I listen and ask about feelings and needs to check how it is for that person. I noticed that people who got to know NVC only superficially often make this mistake and discourage their relatives and friends from themselves and Nonviolent Communication. Why? Because nobody likes others to dictate what they feel and what is important to them! Sometimes I become really angry in this kind of situations, so I warn you not to do that. Remember also that guessing feelings and needs is not about flawlessly naming the right ones, but about showing the other person that we listen to them, that we want to understand them better and to help them in their search. While listening with empathy to other people, especially when they give us a feedback or say/do something we don’t fully understand, we can use the four steps of Nonviolent Communication. Four steps are kind of a scaffold or a skeleton on which we can lean back, especially in the initial period of exploring empathic communication. This path gives us not only a tool to use in direct interaction when we listen to someone. It is also irreplaceable when we want to better understand someone’s behaviour and we do not have the opportunity to check how it is in reality. It helps us see in a person with whom we have a conflict, a man of flesh and blood who has the same feelings and needs as we. It also helps to look beyond words and actions to see what lies deeper. To sum up, we can listen with empathy not only in direct interaction by speaking out loud, but also we can do it quietly in our mind or on a piece of paper to try to better understand someone’s behaviour. Finally, I have a question for you: have you ever wondered why are you listening? What is your intention? Do you want to understand the other person? Are you curious about their world? Or maybe you listen, because “you have to” or to catch the moment when there will be an opportunity for you to say something? Our listening is often selective and not very attentive. It happens that we stop listening, because we start to remember our own story in our head, or we reflect on our answer. Sometimes the silence that may soon come is so frightening that we want to be prepared to quickly say something wise. That is why it is so important to be aware of the intentions with which we listen. If our intention is to support the other person, give them full attention and space, then we listen differently than when the intention is to quickly settle the matter, or when we listen, because we are afraid to interrupt. We also listen differently when we are just curious about the story or want to get some useful information. 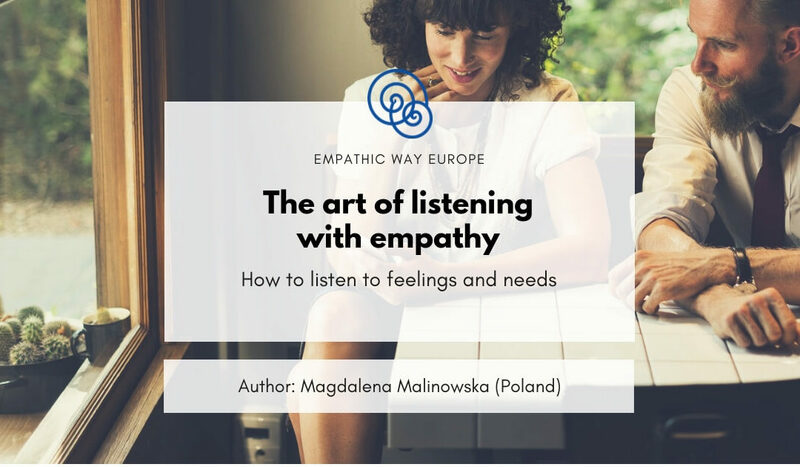 I hope that the ways of empathic listening described in this article will increase your awareness, make it easier for you to understand others and improve your relationships. If listening with empathy is still “a mystery” or does not come to you automatically, you can raise your skills by practicing it in a safe environment. 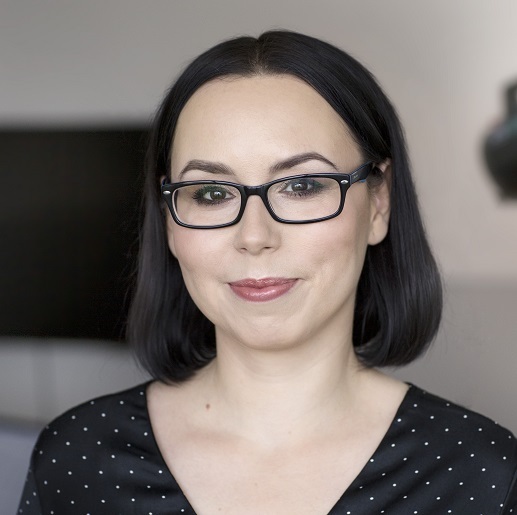 I recommend attending a workshop in NVC – check this link to join my workshops or contact me to book your one-on-one training (contact@empathiceurope.com). You can also make an appointment with someone for a private empathy session. It may be someone from your friends, your partner or a person you met during an NVC workshop. Below I present an exemplary agenda of such a meeting. I advise you to agree in your empathy pair/group that you will stick to it, because such a meeting can easily turn into an everyday chat, and that’s not the aim. Of course, you can talk “normally” before or after the empathy session, but the “empathy time” shall be “sacred” :). My suggestion is to not extend the time of one person, because it is important that everyone has the opportunity to speak and listen. Do a short check-in round (“How are you right now?”), 1 minute per person (if you have enough time). Set the order (who speaks first). Agree on confidentiality and honesty. Decide who is taking care about time and how he/she will let you know that it’s over. When the time ends, the speaker has 1 minute to finish the thought. Before you move on to the next person, you can evaluate what was easy, difficult, what worked well, what did you learn as a speaker/listener, etc. 5 minutes – person A tells what is now “alive” in him/her, what has happened lately, etc., person B listens in silence (saying nothing). 10 minutes – person A is still talking, and person B can start paraphrasing and guessing feelings and needs of person A (what are the feelings and needs of person A now?). Note: we focus on feelings and needs, not on what happened, what someone else could think and feel, etc. 10 minutes – time to close: person B may say, for example: “I have noticed your agitation when you talked about…”, he/she can also share what resonated in him/her the most (this is the only moment, already after empathy, when person B can refer to himself/herself and his/her feelings, but the aim is still to support the other person). Change the roles, now person B speaks. I hope this article has been helpful for you. I wish you a lot of empathic encounters and if any questions arise, just write them in the comment below.